1. Heat a heavy pan over medium flame. 2. Add the apricots, orange juice and sugar. 3. Stir well and when juices start to release, add the salt and mix. 4. Increase the heat to high and cook till it resembles a puree. 5. Adjust sugar if necessary. 6. Check the temperature and if it is between 190F and 200F, remove and transfer to a bowl. 7. Stir well and allow to cool completely. 8. Transfer the jam to a clean glass jar and keep it in the fridge. 9. This stays good for up to 2 weeks. 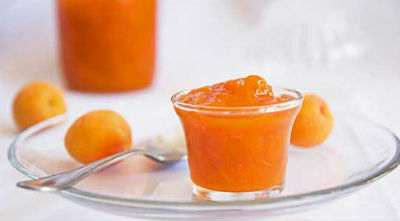 Feel free to comment or share your thoughts on this Apricot Jam Recipe from Awesome Cuisine.